Connetics have blocked the citybound cycle lane on Linwood Ave between Gloucester St & Tancred St with a roadworks sign. Cyclists trying to get past it are forced into the narrow general traffic lane, often in front of a whole line of cars just leaving the Gloucester St intersection. Surely it could have been placed on the grass verge (next to its current position) or moved 5-6m down the road, where the parking shoulder starts to develop. Both options would remove it from the cycle lane whilst ensuring it still remains visible to approaching road users. 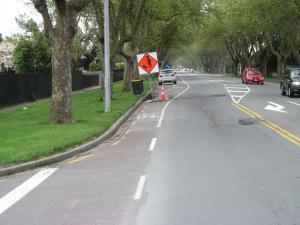 Works finished, so all TTM equipment removed, including sign in cycle lane.